Reid of Nevada saw an opening on the issue to press the case against the Redskins and their owner Daniel Snyder. In remarks on the floor, Reid said his state includes a number of Indian tribes, and he called on NFL Commissioner Roger Goodell to force Snyder to "remove this degrading term from the league." "Since Snyder fails to show any leadership, the National Football League should take an assist from the NBA and pick up the slack," he said. "For far too long, the NFL has been sitting on its hands doing nothing while an entire population of Americans has been denigrated." "Follow the NBA's example and rid the league of bigotry and racism. Your fans will support it." The D.C. football team’s name has long been the source of controversy, angering many for its connection to a time of intense discrimination against Native Americans. Snyder contends the name, which the team’s had for 80 years, is part of a tradition important to fans. Reid said Snyder's hiding behind the Redskins' supposed legacy, but "a tradition of racism is all the name leaves in its wake." In response to ongoing backlash over the team's name, Snyder announced last month a nonprofit, the Washington Redskins Original Americans Foundation, to benefit Native Americans. Goodell has praised Snyder's efforts and pointed to fan support in keeping the name, but has also soften his tone saying in October that the NFL should “make sure we're listening to our fans” on the matter. Even President Barack Obama said if he owned the team and he knew the name was "offending a sizable group of people," then he would "think about changing it." Still, the pushback isn't easing up on Capitol Hill. A "Change the Mascot" campaign launched last year, airing radio ads in the D.C.-area. 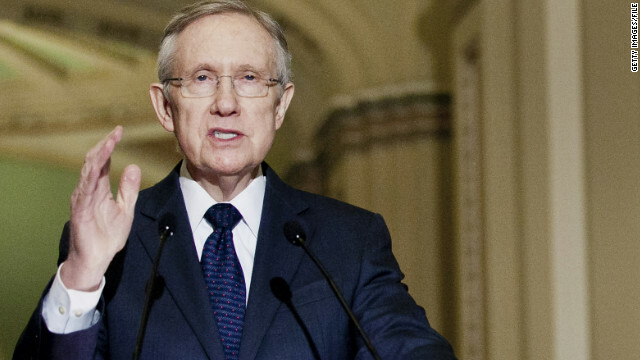 Reid, the top Senate Democrat, and a number of lawmakers have continued pushing for the team to change its name. Two members of Congress, Sen. Maria Cantwell, D-Washington state and chairwoman of the Indian Affairs Committee, and Rep. Tom Cole, R-Oklahoma, who is a member of the Chickasaw Nation, wrote a letter in February to Goodell calling the Redskins' name "an insult to Native Americans." The Oneida Indian Nation issued a statement Tuesday praising Silver's move and said the NFL should follow suit. “In banning Clippers owner Donald Sterling, NBA Commissioner Adam Silver and other NBA team owners have taken a courageous stand against racism in professional sports, acknowledging that professional leagues cannot be a platform to promote bigotry,” said Ray Halbritter, a representative for Oneida Indian Nation. Co-signed. Give 'em hell Harry. "Snyder contends the name, which the team’s had for 80 years, is part of a tradition important to fans." And racist pigs like Strom Thurmond contended that segregation was part of a tradition important to America. So yeah, we've heard that line of malarkey before. @Sniffit, no mention of that Democratic lion Robert Byrd????? "@Sniffit, no mention of that Democratic lion Robert Byrd?????" You mean the guy who disavowed all of it, admitted he had been wrong, apologized profusely and lived the rest of his life not being a racist? And the country should kick Reid out of office! He's an evil, old, angry man, and doesn't deserve one more tax dollar from any American! He isn't serving this country – he only serves himself – and his mean intentions. Is that all you have to do Harry? Reid, the never ending voice of Obama. Nevada, how could you possibly elect this senile ignorant old fool to office? If that wasn't bad enough, the clueless Democrats then elect him to a leadership position! Harry Reid has proven that while you don't have to be completely brain dead to be a Democrat, it sure does help. Obama, Reid and Pelosi.... the Three Stooges of the Democrat Party. Look everyone, Yolanda quick did a Googlez and found one Dem she could criticize (incorrectly as Sniffit shows) to argue about the many instances and pervasive GOP racial bias. That is a theme like "hey I saw a blog about one guy whose insurance went up so Obamacare is a failure!" Harry Reid is such an odious man. Like his cohort Obama who the country also greatly suffers from, he is a proven liar. LIARS, all of them. "Is that all you have to do Harry?" Yeah, I mean, clearly his utterance of all of 45 seconds to 1 minute worth of words indicates he's done nothing else all day. I think rappers who use racist language that offends people and women should change. Also, I think the New Orleans Saints should change their name because I am an atheist. It is very offensive. Oh, and the Sabres should change their name as well because a Sabre is violent and I am against such things. And the Hurricanes should change as well because of Katrina. What happened to freedom of speech or does it apply to only some people and not all. What part don't people we all have the same right but we shouldn't just let people judge someone for what they on a private phone call that was recorded without their knowledge. The haters from faux news and the koch brothers ill are out in full force. Do you people get paid? The problem with the Washington team is that their little owner has already done things he (we would be) should be in jail for like cutting down federal land trees so that he could see the Potomac from his mansion. I guess he didn't have those glasses on when he saw the property and the trees were already there. The Washington Post reporter called him out on whatand who sneider really is. The little man tried to sue him but you can't sue for slander when you tell the truth. That went away pretty fast. What Washington needs is a new owner. This guy spends money like there's no tomorrow but . . . . . the team $ucks!